Celiac disease, also know as celiac sprue and gluten-sensitive enteropathy, is an autoimmune digestive disease caused by permanent intolerance to gluten, the major constituent of protein in wheat, barley and rye. When gluten is ingested, the immune system triggers a localized inflammatory response in the small intestinal mucosa that interferes with absorption of nutrients. Affected individuals develop villous atrophy of the small intestine and malabsorption that results in diarrhea, growth retardation, delayed puberty, anemia and osteoporosis. These symptoms resolve following removal of gluten from the diet. A lifetime gluten-free diet can completely stop the immune response. However, reintroduction of gluten containing foods stimulates the immune response again. Celiac disease prevalence in the United States is between 0.5 and 1%. Celiac disease is much more common in individuals of European descent and has a strong genetic predisposition. Affected patients almost always express the HLA antigens HLA-DQ2 and HLA-DQ8. Glutens interact with these HLA molecules to activate an abnormal mucosal immune response and induce tissue damage. Symptoms may present at any age, from infant to adult. Infants present after cereal is introduced to their diet. Symptoms are nonspecific and highly variable; they include intermittent diarrhea, abdominal pain, bloating, vomiting and anorexia. Symptoms may disappear in later childhood or early adolescence despite continued signs of malabsorption. Even asymptomatic patients will develop villous atrophy. High-risk populations that should be screened for celiac disease include those with symptoms, individuals with autoimmune disorders, (e.g. type 1 diabetes, thyroid, adrenal, liver, and Sjögren’s syndrome), and first- and second-degree relatives of patients with celiac disease. Screening of the general population is not recommended at this time. Patients with celiac disease produce several antibodies including gliadin, endomysial, tissue transglutaminase (tTG), and reticulin. 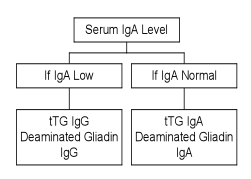 IgA antibodies usually predominate, but IgG antibodies are also synthesized. Serological testing offers a minimally invasive option for detection of individuals likely to have celiac disease and to select those patients who may need biopsy. Accurate diagnosis of celiac disease requires that patients have gluten in their diet at the time of testing. Previous celiac panels included more than one of these antibodies. However, new consensus guidelines from the National Institutes of Health recommend initial testing with only tTG antibody (Celiac Disease Summary, Evidence Report/Technology Assessment #104, AHRQ Publication 04-E029-1, www.ahrq.gov). Sensitivity of tTG antibody is 95- 98% and specificity is 95%. tTG is the primary auto-antigen recognized by endomysial antibodies in patients with celiac disease. Antibody levels correlate with severity of enteropathy. Two percent of patients with celiac disease will be IgA deficient and unable to make IgA antibodies. This subset of patients needs to be tested for tTg IgG. Therefore, a useful starting point is to determine if the patient is IgA deficient so that the correct tTG antibody can be ordered. The following test algorithm is recommended. New tests for deamidated gliadin IgA and IgG have replaced the older gliadin antibody tests. Sensitivity and specificity of deaminated gliadin antibodies for untreated celiac disease is comparable to tTg antibodies. A diagnosis of celiac disease should not be made on the basis of positive serological tests alone. Multiple small bowel biopsies from the second part of the duodenum or beyond are needed to confirm the diagnosis. The only exception to this rule is if the patient has biopsy-proven dermatitis herpetiformis. A positive serological test with a diagnostic biopsy in a patient with gluten in his or her diet allows a presumptive diagnosis of celiac disease. A definitive diagnosis is provided by resolution of symptoms following the introduction and maintenance of a strictly gluten-free diet. TTG antibody levels begin to decline within 6 to 12 months after institution of a gluten free diet. However, routine follow-up testing is not recommended. When the diagnosis of celiac disease is uncertain because of indeterminate results, HLA DQ typing can stratify individuals to high or low risk for celiac disease. More than 90% are HLA-DQ2 positive and <10% are HLA-DQ8 positive. Therefore, an individual who is negative for DQ2 and DQ8 is extremely unlikely to have celiac disease. DQ typing cannot be used as a screening test because 40% of the general population also carries these markers. Patients with dermatitis herpetiformis (DH) also have an autoimmune response to gluten intake. DH presents as a severely pruritic rash with blistering on the extensor surfaces of the extremities. Patients with DH develop the same intestinal damage as patients with celiac disease, but my not have intestinal symptoms. DH is usually diagnosed by skin biopsy. Serologic tests for celiac disease may be used to confirm a diagnosis of DH and to monitor compliance with dietary gluten restriction. The antibody response in DH may be more variable than in celiac disease. Strict adherence to a gluten-free diet often induces remission of both the skin and small bowel abnormalities. It is very important that the patient be on a normal gluten-containing diet before testing unless the patient is known to have celiac disease. Specimen requirement is one red top or SST tube of blood. A minimum of 0.25 mL is required for pediatric samples.